There are a lot of great trail riding saddles for sale to choose from, and comparing them can be time consuming and confusing. We hope the following table of saddle specifications helps you on your search. Trail riding saddles are made with comfort for both horse and rider in mind, even after lots of hours on the trail in the saddle. 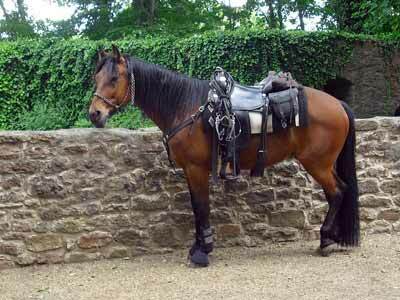 You might also like: Trail riding saddles for short backed horses. A trail rider rides through a hilly, wooded area. NOTE: The information in the table below is NOT guaranteed to be correct! We did our best to do accurate research but mistakes could have been made, or saddle information could have changed. It’s up to you to verify any information you find here. Click/tap any table heading to sort. Wt. – Weight in pounds. All weights shown are approximate. Cantle – Cantle height in inches. Skirt – Saddle skirt shape. Below are a handful of completely random notes about a few things we’ve noticed among popular trail riding saddles. Synthetic Saddle Trees – A synthetic tree is (usually) lighter in weight than a traditional wood tree. While types of synthetic trees and their attributes vary, they commonly contribute important factors to a trail riding saddle such as lighter weight, the ability to withstand moisture without warping, and a lower price tag. Synthetic Materials – Some trail riding saddles (but certainly not all) use synthetic materials in their construction. While stepping away from using only traditional leather when making a saddle may seem strange to some, saddles incorporating synthetic materials have been on the market for years and are extremely well received among their fans. Synthetic materials are lighter than leather, less expensive, and have the added bonus of being easier to clean. A trail saddle that uses synthetic materials in its construction might be made mostly with synthetics, or be a combination of leather and synthetics. Less Saddle – Some trail riding saddles are trimmed down from excess material which helps to contribute to an overall lighter weight. One common area that might be trimmed down is the housing (aka “jockey”). The housing covers parts of the saddle beneath it that would otherwise be exposed, like the saddle tree. In a trail riding saddle, the housing might be trimmed down, or eliminated all together. Another area that is might be trimmed down is the saddle skirt: Instead of a large, square skirt, some trail riding saddles have smaller, rounded skirts that help reduce weight. To find a lightweight trail riding saddle, you can use our interactive table at the top of the page to sort the trail saddles by weight. 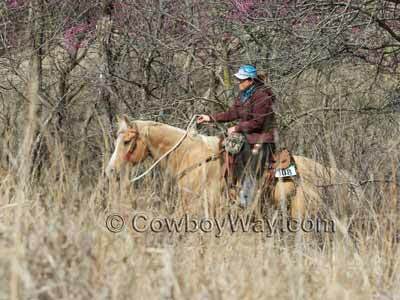 Below: Trail riding saddles don’t have to be heavy to be a quality, well-made saddle. Circle Y makes a trail riding saddle with a “cowboy look” they call the Circle Y Walnut Grove. It’s a trail riding saddle through and through with a Circle Y “Flex2” saddle tree; three way, adjustable, in-skirt rigging; Circle Y’s “tunnel skirt” design to keep the horse’s spine free of pressure and allow for increased air flow; padded seat, and other features to make it comfortable for horse and rider on the trail. The Circle Y Walnut Grove also has a definite “cowboy” look to it, which is uncommon for a trail riding saddle. It is built on Wade, slick fork saddle tree, has beautiful floral tooling with border detailing, and iron conchos featuring a bronc riding cowboy. You can check it out here: The Circle Y Walnut Grove trail riding saddle. As we’re sure you’ve noticed some trail riding saddles come with a round skirt as opposed to the traditional square skirt so often found on saddles. So, what are the advantages of a round skirt on a trail riding saddle? Lighter Weight – A rounded skirt means less skirt, and therefore less weight. It’s one of the easiest and most popular options out there to make a saddle weigh less. More Comfortable For A Short-Backed Horse – If your horse has a short back, he might appreciate a rounded skirt over a square skirt. A rounded skirt gives a short-backed horse more room to move without interference from the saddle skirt. To find a trail riding saddle with a round skirt, you can use our interactive table at the top of the page to sort the saddles by skirt. Below: A 1973 photo showing trail riding saddles on horses in the Adirondack Forest Preserve in Warrensburg, New York. 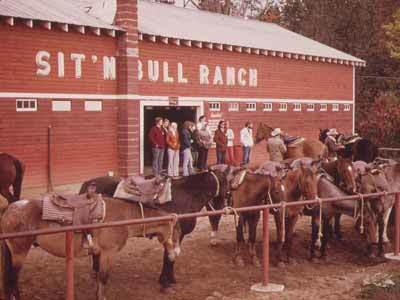 Notice the first two horses on the left are wearing round skirted trail riding saddle.